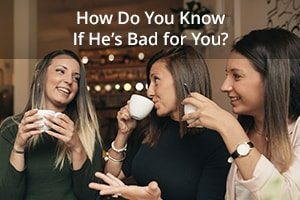 How Do You Know If He’s Bad for You? The girl who doesn’t see the warning signs about the guy she’s with. She’s so happy to be with him that you can’t say anything. You exchange concerned glances with other friends, but you know the rules. It’s not your place to comment. Besides, maybe you don’t know him as well as she does. There must be something good about him. You’re just waiting for the fall. For the day she calls you up and tells you she needs you to come over right away, because something REALLY bad has happened. You’re going to be there for her when that day comes. And then you’re finally going to tell her the truth about what you knew all along. Whether a relationship is healthy or not doesn’t matter to someone in love. When you love someone, all you know is that you want to be with him. You want to make it work no matter what. If things get hard, you work harder. Obstacles only strengthen your resolve. It’s not my job to tell people whether they should split up or stay together. What I think of someone’s relationship isn’t as important as what they think of their relationship. But I do see unhealthy relationships. It’s hard not to notice sometimes. Here are 3 tipoffs that can help you recognize a relationship that’s not good for you. Your self-esteem has been going up and down a lot. Some relationships lift us up. They make us feel stronger, happier, and better able to take on the world. Other relationships lift us up only to dash us down. They’re a roller coaster of emotion. Rocky relationships can consume your life. You hang in there, because the good times are SO good. You keep hoping you’ll find a way to make it work, so you can live happily ever after. There’s a lot of satisfaction in fighting to keep the relationship together and make him happy. The harder you work on your relationship, the more committed you feel. You can’t give up now. Not after how much effort you’ve put in. But if the thought of splitting up fills you with terror, you might want to ask whether it’s love or fear keeping you in the relationship. You’ve started doubting yourself more since you’ve been with him. Good, responsible women often believe that they’re the problem in the relationship. They know they’re not perfect. So they strive to be even better—a better girlfriend, a better wife—in the hope that he’ll see the light. You shouldn’t feel as if you have to engage in a daily struggle to earn your man’s respect, love, and appreciation. Those things should be a given. Some men don’t know how to do the work of loving another person. They take their partners for granted. 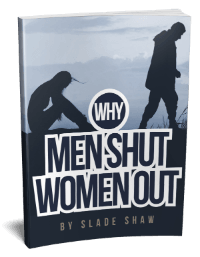 They’re not interested in learning how to show up and support the women in their lives. 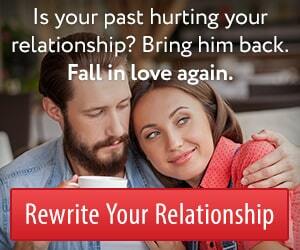 It can be really hard to see that the man you love doesn’t love you in the same way. It can be even harder to see that how much he loves you is based on his own capacity to love, rather than your worthiness. If you’re struggling in the relationship, and you think the problem is you, consider what his ex-girlfriends might say about him. Does this man know how to love and honor a woman? You’re afraid of finding out what your friends really think about him. Your friends are people who know and love you. They have a spectator seat to your relationship. They’ve seen how you’ve changed since you’ve been with him. Good relationships make you shine. Your friends can see that you’re happier, healthier, and more peaceful than you’ve ever been. Bad relationships cast a shadow on you. Your friends can see that you’re hurting, even if you can’t. It’s not their place to tell you what they really think of him, but that doesn’t mean they won’t open up if you ask. How they think you’ve changed since you’ve been with him. That answer will tell you everything you need to know. This entry was posted in Dating, Relationships and tagged bad relationships, identifying bad relationships by James Bauer. Bookmark the permalink. A very open-eyes article!!! It’s such a shame that people stick to unhealthy relationships due to what I call emotional dependency. I love this essay!! !